25mm Egyptian National Flag Badge. 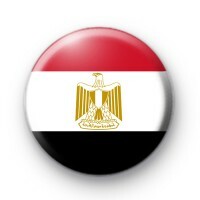 The flag of Egypt has three equal horizontal bands of red, white, and black and Egypt's national emblem, the Egyptian eagle of Saladin centred in the white band. Our World Flag badges are great for sporting events, schools and football.